In Polar Covalent bonds, Induction is the attraction of the shared electrons in a bond towards the more electronegative atom. 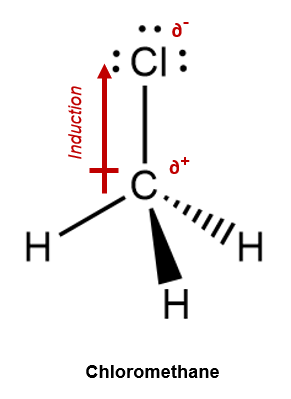 For Example – The molecule Chloromethane comprises 3 C—H bonds and 1 C—Cl bond. The electronegativity of the atoms are C = 2.55, H = 2.20 and Cl = 3.16. Therefore, we note that the C–H bonds exhibit negligible polarity while the C—Cl bond will exhibit observable polarity. The Cl atom will pull the shared pair electrons with aa greate force thereby giving rise to a partial negative charge on itself and a partial positive charge on the Carbon atom. Electronegativity increases along the left to right. Eg: Cl is more electronegative than Na.